Mommy, Esq. : OH, CRAP!! WHAT DO I DO NOW?!? I was feeling pretty good about my ability to take care of kids. Dinner and bedtime by myself with Wife in London? No biggie. I was pretty cocky about being better at changing diapers than most other dads. Figured that I could handle pretty much anything a baby could throw my way--or even two babies. (Those one-baby daddies are a bunch of pansies next to me.) I was the smooth, cool, unflappable Ninja Master of Dads. I thought all that until last night. That was the night when all my training and experience came up short. The night when I was just another helpless father. The night it all went wrong. The night I re-learned humility. It was The Night When Penny Pooped in the Tub. Yank both kids out of the tub. Ned still soapy, unrinsed. Penny suddenly dirty again. Both crawling around the bathroom floor getting things wet (and worse). Me, staring a the turd peeking out of the bubbles, trying to plan my next move. OK, there's the bucket we use to dump water on their heads. Scoop up the turd in that. Well, most of it. Crap. Now I've got a bucket of water with a rapidly disintegrating Penny poop. What do I do with it? WHAT DO I DO? I stand there trying to figure out how to deal with the situation. Crazy ideas go through my head. Strain out the turd somehow to throw it away. Toss the whole bucket in the yard. Kitchen garbage disposal, maybe? WHAT THE HELL DO I DO WITH THIS POOP BUCKET!?!?? Oh, right. There's a toilet right there. That'll work. 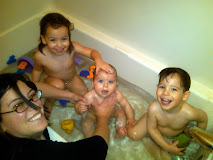 The rest of the incident was straightforward, trying to quickly clean the worst out of the tub and rewash the kids. But the damage to my confidence was done. I just froze up in the moment of crisis. Useless in the face of disaster. I guess it turns out I'm just as helpless as the next dad. At least I was last night, The Night When Penny Pooped in the Tub. Oh no!! Way to regroup and handle the situation, though! Great story! We've been there, but in the kitchen sink when they were much smaller. At that moment, , the garbage disposal seemed to be the most genius of inventions. A friend of mine's four-year-old pooped in the POOL at the Y at a pool party. A truly "doodie" moment. Poop in the tub has to happen sometime to every parent. You handled it wonderfully!!! It happens to everyone. Hell, it happened to me just last week and I don't even have kids.